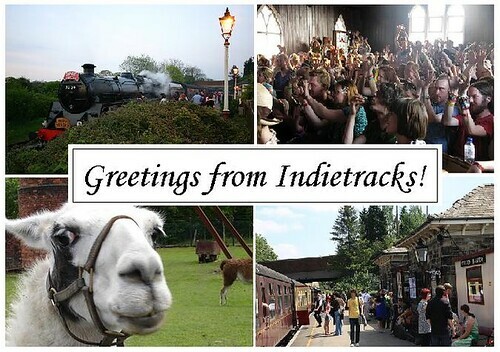 Indietracks - an indiepop festival: Greetings from Indietracks! Well, by the time you read this, Team Indietracks will be travelling to the festival site. The stages have been built, the programmes are printed, the refreshments have arrived and people are travelling from literally all corners of the globe to descend on the Midland Railway Centre. Tickets: weekend and day tickets will be available on the gates. Cancelled train strike: the latest information we have at the time of posting this is that the East Midlands train strike - scheduled for Friday and Monday - has been cancelled. Please visit the East Midlands Trains website for the latest information. Schedule: the timeslots for the bands and workshops will be printed in the festival programme and are also listed on the Indietracks website. Mixtape swap: don't forget to bring your mix CDs for the mixtape swap. Follow the festival on Twitter: we'll be tweeting during the festival @ indietracksfest, and guardianmusic will be doing so too. If you're also tweeting from the festival, apparently if you put '#indietracks' at the end of your tweet it'll make all the festival tweets easier to find. Or something. Weather: the BBC says 'sunny' on the Saturday and 'light rain' on the Sunday, so please come prepared for both! See you at the festival! Choo Choo! Gingham covered thanks to Alice for organising the Workshop Wigwam. We had lots of fun making bunting with everyone that came to our workshop and meeting fellow crafty types from Tatty Devine, Hey ho lets sew, Craft Guerrilla and Buttons for eyes! Thanks to everyone that came and please email me if you would like a pic of you and your bunting and note of what you made!